One of the best things about teaching abroad, including teaching in Abu Dhabi, is the freedom of having fewer responsibilities and demands on your time. Don’t get me wrong, you will work hard but in so many ways, it still feels like a vacation and I promise; by getting a teaching job in Abu Dhabi, you’ll have the opportunity to be a little selfish and indulge yourself during your off-hours in ways you never could at home. Here is a glimpse of what you could be doing while teaching in Abu Dhabi (and I mean a glimpse since these are only a few of many attractions at your fingertips when teaching in Abu Dhabi). After a full (and of course, rewarding) day of teaching in Abu Dhabi, you could probably use some quiet time. 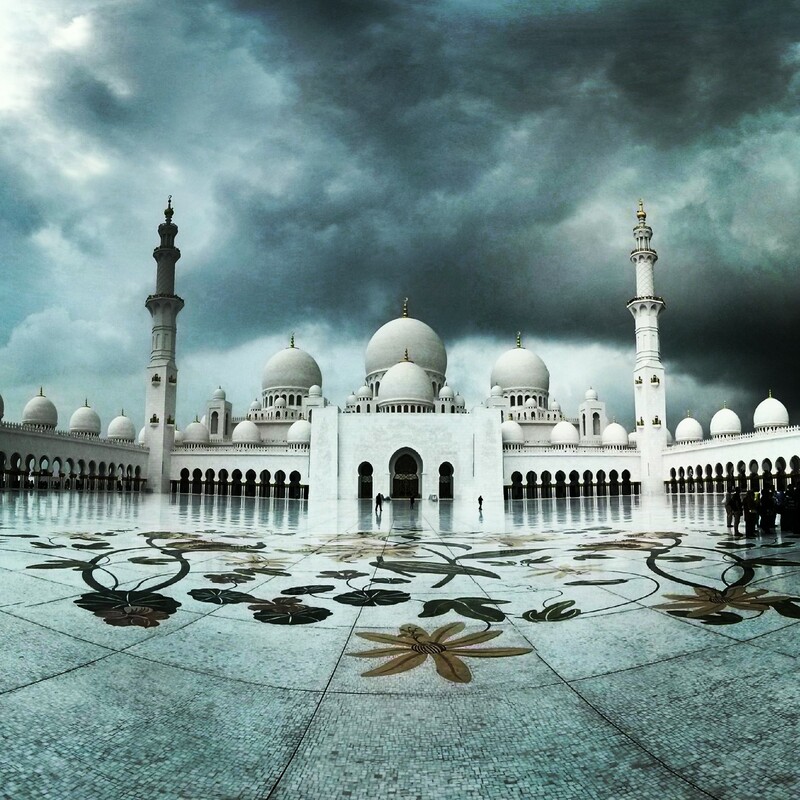 Why not visit Sheikh Zayed Grand Mosque? It’s the largest in the world and can accommodate a mind-boggling 40,000 worshippers! Open daily to visitors except for Friday mornings (reserved for worshippers), you can walk around and admire the hundreds of domes and columns and one of the world’s largest chandeliers weighing 12 tonnes! You can also sit by one of the many reflective pools and enjoy the tranquility. here’s another great place to enjoy the quiet and commune with nature. Al Ain Oasis covers about 3,000 acres of palm plantations, including working farms employing a 3,000 year-old irrigation system. You can enter this “inner-city paradise” through eight entrances (free) and stroll along the shaded walkways and water channels. If you’re like me and the ocean calls to you, then you want your teaching job in Abu Dhabi to bring you close to Corniche Beach. This gorgeous stretch of beachfront has received Blue Flag status, a recognized international eco-label that guarantees clean and safe water. Whether you plop yourself under a beach umbrella with a good book, dive in headfirst, or prefer to jog or walk around (or rent a bike), there’s nothing better after a long day or a long week in the classroom than breathing in that salty air and admiring the view. It’s nice to relax but if you’re looking for a little more excitement while teaching in Abu Dhabi, you won’t be disappointed. Teaching jobs in Abu Dhabi come with a side of theme parks (yes, plural). You can spend that day at Hili Fun City, which has been newly renovated with 28 attractions, amphitheatre and picnic areas. There’s also Yas Waterworld with 43 rides, including the first and largest 238-metre long hydromagnetic-powered, six-person tornado waterslide and the largest surfable sheet wave for flowboards and bodyboards. Last but not least, visit the world’s first Ferrari theme park, which tells the Ferrari story through exciting (and educational) rides, attractions and displays, including the world’s fastest roller-coaster. You can also take in some interactive shopping and authentic Italian dining. As you can see, it’s so much more than a teaching job in Abu Dhabi!